Since first discovering the exciting pursuit of crafting bean-to-bar chocolate, we’ve become increasingly passionate about all aspects of the process. From sourcing the cacao beans, to experimenting with different roasting methods, to refining and conching, there are a myriad of variables which can be adjusted to alter the flavor of the final product. 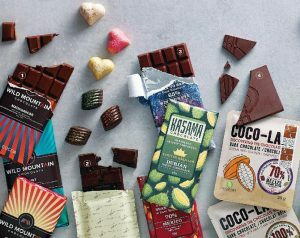 While we had been eating dark chocolate from the grocery store for years, it was only once we started making it from scratch and tasting the products of other bean-to-bar makers, that we began to appreciate the diversity and complexity that was possible. Not all cacao beans are the same. Depending on the bean variety, its place of origin, growing conditions, and post harvest practices, a wide range of flavors can be obtained – everything from tart and citrusy, to earthy and bourbony. Once we opened the door to the world of craft chocolate and discovered the passionate, burgeoning community surrounding it, we were hooked. Cacao doesn’t grow locally, but chocolate is an extremely versatile food which can be combined with all manner of ingredients to create exciting flavor combinations. Whenever possible, we love to use ingredients from local vendors and producers in our bars and truffles. We very much value an atmosphere of mutual collaboration, support, and community building. 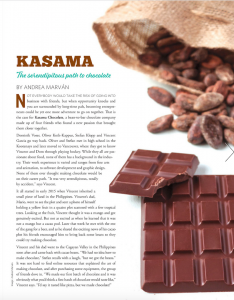 Andrea Marván wrote an wonderful article about us in Edible Vancouver. Read the Edible Vancouver: Almost Spring 2018 issue for more info on how we got started and how we make our bean-to-bar chocolate. The following video was shot in the summer of 2016 by our friends at Infinitum Films and shows how we got started and how we make chocolate. Many of the processes are still the same today, just with better equipment and workflow. Enjoy!